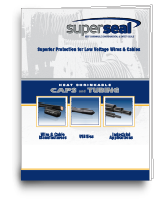 Super Seal Corporation appreciates your interest in its products and your visit to this website. This Web site may contain links to other sites. Please be aware that Super Seal Corporation does not claim any responsibility for the privacy practices of such other sites. We encourage our users to be aware when they leave our site and to read the privacy statements of each and every Web site that collects personally identifiable information. This privacy statement applies solely to information collected by this Web site. You may choose to provide personal information (such as your name, address, telephone number and email address) on this web site or to GE Appliances via other methods, such as product registration, scheduling a service call or delivery, making a consumer inquiry, purchasing parts and participation in our promotional activities. Here are some of the ways you may provide the information and the types of information you may submit. We also tell you how we may use the information. If you email us through the "Contact Us" link on this site, we ask you for information such as your name, address, email address, company name, phone/fax number so we can respond to your questions and comments. You may choose to provide additional information as well. If you email us through the "Request Quote" link on this site, we ask you for information such as your name, address, email address, company name, phone/fax number so we can respond to your questions and comments. You may choose to provide additional information as well.